Nori (seaweed) is a core ingredient found in 99.5% of all sushi rolls. It’s thin, dark green, dried, compressed seaweed that is used to hold the sushi roll together. The production of this type of seaweed dates back to 700 AD in feudal Japan. Today, 230 sq. miles of Japanese coastline is dedicated to producing over 340,000 tons of seaweed per year. That’s 2/3 of the total production in the world! At a range of 30-90 cents per sheet, that produces over 1 billion dollars (USD) of profit per year! This sounds like a highly processed product. I hear processed foods are bad for you… Is this really okay to eat? Bid- Each company bids on a batch of seaweed and then cuts and packages it themselves. Why do sushi chefs use it? Most people don’t realize it, but seaweed is, bar none, the most nutritional ingredient in any roll. Seaweed is easy to grow, easy to process, and it can be seasoned in a multitude of ways. Not to mention it’s cost efficient and honestly rather tasty! Seaweed (after it’s been dried and compressed) is approx. one third protein and one third dietary fiber by weight. Did you notice how much Vitamin C that was? 210mg is approx. 3 times the amount in an average orange! Not to mention almost twice the daily value! Let’s be real here: No one eats 100g of seaweed in a day. That’s true. 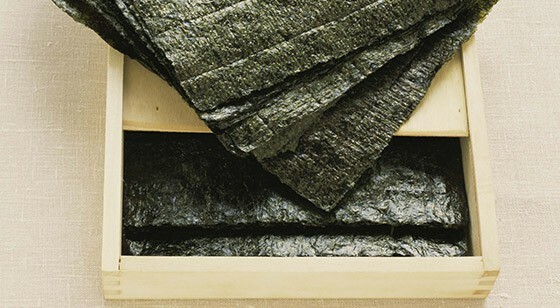 The average sheet of nori is only about 3 grams. The above information is to show exactly how nutritious it can be. On a “per serving” scale, the seaweed has approx. 10 calories, 5 mg of Vitamin C, and 1 gram of protein.